The practical part of Vedic Mantras is dealt with by Kalpa. This Vedāṅga is considered as the two hands of Vedapuruṣa. Hands are very useful in different activities in Loka and Kalpa is similarly useful in the performance of Vedic rites. After Jyotiṣam it is Kalpa that is most sought after Vedāṅga by common people, although the term is neither understood nor employed by many. By performing different Karmas (rites), one would get cittaśuddhi (cleansing of mind) and it leads one to Mokṣa. kalpyate samarthyate prayogaḥ atra iti kalpaḥ. atra = in this Vedāṅga, prayogaḥ = the practical part, kalpyate / samarthyate = it is being illuminated, iti = therefore, kalpaḥ = it is called Kalpa. A detailed account regarding the performance of different rites is being provided by this Vedāṅga and therefore it is called Kalpa. So the term conforms to meaning. The seeds of Kalpa, popularly known as Kalpasūtram, can be traced to Kṛṣṇayajurveda (Taittirīyāraṇyakam 1-123, 128, 130). iti mantrāḥ. kalpo’ta ūrdhvam. . . . saṃvatsarametad vrataṃ caret. dvau vā māsau. . . . araṇye’dhīyīta. iti mantrāḥ= till this point they are Mantras; ataḥ ūrdhvam = hereafter, kalpaḥ = Kalpaḥ, i.e. the practical part; caret = one should practice, etad vratam = this ascetic lifestyle called vratam, saṃvatsaram = for a full one year; dvau māsau vā = in case of inconvenience it can be for a full two months, adhīyīta = one should recite Veda, araṇye = in a forest. Till this point they are mantras. Hereafter it is Kalpa. One should practice this vratam for a full one year and in case of any inconvenience it should be for a full two months. Kalpasūtras can broadly be divided into two branches – Śrautasūtram and Gṛhyasūtram. The former exclusively deals with the performance of different Yāgas (Sacrifices) while the latter deals with different saṃskāras, such as vivāha (marriage), that are to be applied to each person. Śulbasūtram, that deals with Geometry is considered as a subsidiary of Śrautasūtram as it is useful in effecting measurements of Yāgaśāla (cottage for Yāga) etc. Dharmasūtram or Dharmaśāstram is a subsidiary of Gṛhyasūtram and it ordains as to what is Dharma and what is Adharma. There are 1,130 śākhas (branches) of Veda – Ṛgveda – 21, Sāmaveda – 1000, Yajurveda – 100 and Atharvaveda – 9. At present only 12 śākhas are available. As a result the origin of all Sūtras of Kalpa is not available in Veda but since great Ṛṣis had authored these Sūtras with the help of Divyadṛṣṭi (clairvoyance) it is inferred that their sayings have got their roots in Veda. For Śrautasūtram the evidence is clearly available in Veda. For Gṛhyasūtram and Dharmasūtram, authored by sages, the Vidhivākyas (injunctive sentences) or the texts of itikartavyatā (procedure) are not available in the available Vedaśākhas. But since Śiṣṭas (those who follow the norms of Dharma, Artha, Kāma and Mokṣa and are exemplary) have been practicing the Karmas, cited in Gṛhyasūtram and Dharmasūtram, since time immemorial and established an uninterrupted tradition, they are accepted as an authority and it is inferred that their origin was in Vedaśākhas that are lost. Veda can be divided into two main parts – the first called Mantrabrāhmaṇabhāga and the second Upaniṣadbhāga. The former deals with Dharma through Karma, i.e. performance of Yāga (Sacrifice) etc. whereas the latter deals with Brahma, i.e. Mokṣa and related matters. Pūrvamīmāṃsā or Mīmāṃsādarśana discusses the meaning of Vedic sentences with regard to the earlier part, i.e. Mantrabrāhmaṇabhāga of Veda. Uttaramīmāṃsā or Vedānta deals with the latter part of Veda, i.e. Upaniṣads in order to establish the path for Veda. While Pūrvamīmāṃsā takes care of the meaning of Mantrabrāhmaṇabhāga, Kalpa sets the stage for the practical part, i.e. how and where a Yāga is to be performed. Jyotiṣam, Śulbasūtram and Dharmaśāstram also play their role in the overall process of a Yāga. Śruti means Veda whereas Smṛti means Dharmaśāstram. Yajña, Yāga, Adhvara, Kratu etc. are synonyms. The literal meaning of Yāga is ‘worship’. Offering a samit (firewood of certain trees) in the holy fire is Devayajña. Offering water to father, father’s father and his father as well as to mother, her mother-in-law and her mother-in-law by name, Gotra and ‘svadhā’. This offering is only to those who passed away. Offering Bali (food) to beings is called Bhūtabali. Offering food to one or more Brāhmaṇas is called Manuṣyayajña. Recitation of at least a single Ṛk or Yajus or Sāma is called Brahmayajña. Vedāṅgas are added as they are part and parcel of Veda. While deriving the word ‘patnī ‘ (wife), Pāṇini rules that wife of a person who performs Pañcayajñas only is fit to be called ‘patnī ‘ (‘patyurno yajñasaṃyoge’ Pāṇinisūtram 4-1-33). Elsewhere the usage of the word is following semblance. According to Mīmāṃsakas Yāga has got two forms – Dravyam (material used in Yāga) and Devatā (the God to whom the oblation is offered). On the other hand, Śrautasūtram (Kātyāyana) adds ‘tyāga’ (dropping the material in holy fire while reciting Mantra) to Dravyam and Devatā. If, while invoking a God, some material is dropped in holy fire it is called Homa. Sandhyāvandanam (the salute during dawn and dusk), Agnihotram (worship of Fire-god), Svādhyāya (recitation of Veda and Vedāṅgas), Pañcamahāyajñas etc. are called Nityakarmas. Ābdīkam (yearly death ceremony), Gṛhapraveśa (house-warming ceremony) etc. are called Naimittikakarma. Vivāha (marriage) is meant for children, Putrakāmeṣṭi is meant for children. Satyanārayaṇavratam is meant for overall prosperity. Such rites are called Kāmyakarma. There is prāyaścittam (penance), which is performed after committing something wrong. Yajamānaḥ - The person who performs the Yāga is called Yajamānaḥ. by a norm - dampatyoḥ sahādhikārāṭ (sixth Adhyāya of Pūrvamīmāṃsā). In other words, neither is superior / inferior to the other in terms of Dharma, Artha and Kāma. This fire is located near the western end of the ritual enclosure called vihāra. side (dakṣiṇā) of the vihāra. ३. 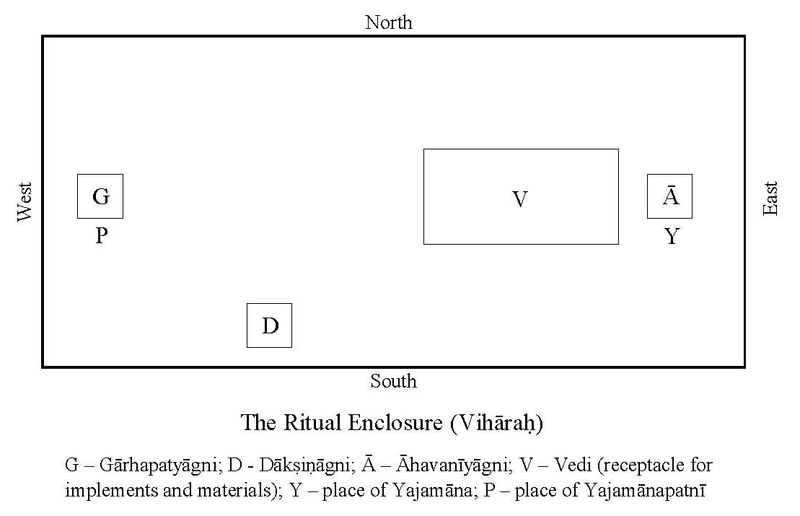 Āhavanīyāgni – This is the fire wherein offerings are made and it is located near the eastern end of the vihāra. This is also brought from Gārhapatya. १. Seven Pākayajñas – i. Aupāsanahoma, ii. Vaiśvadevam, iii. Pārvaṇam, iv. २. Seven Haviryajñasaṃsthāḥ - i. Agnihotram, ii. Darśapūrṇamāsau, iii. ३. Seven Somasaṃsthāḥ – i. Agniṣṭomaḥ, ii. Atyagniṣṭomaḥ, iii. Ukthyaḥ, iv. Agnicayanam – This is an Aṅga (part) of Somayāga. A Vedi (altar) of five layers is built with bricks while reciting mantras and the same activity is called Agnicayanam. Pratipattikarma (Mīmāṃsāsūtram of Jaimini 11-3-43, 44, 45. Śābarabhāṣyam 11-3- 34, Satapathabrāhmaṇam 12-3-5-2). There are ten instruments called Yajñāyudhāni or Yajñapātrāṇi. The Yajamāna of a Yajña has to preserve the Yajñāyudhas and these, at the end, are to be placed on the pyre along with the body of the Yajamāna. This activity is called Pratipatti. Sruk – An instrument used to drop ghee (clarified butter) in the fire. Following the wood it is made of, Sruk is divided into three – Juhū, Upabhṛt and Dhruvā. Sruvaḥ – The instrument meant for collecting ghee from the pot. Upavītam – In all Daivakāryas (rites related to God) the Yajñopavītam (sacred thread) should be under the right hand and this is called Upavītam (Taittirīyāraṇyakam 2-1). Prācīnāvītam – The Yajñopavītam should be under the left hand during Pitṛkarma (rites related to fathers, such as death ceremony) and it is called Prācīnāvītam. Agnimathanam (churning for Agni, i.e. producing fire) – Agni is produced through friction by using two specific dry wooden pieces. Subrahmaṇyā – Name of a Nigada (a mantra) in Taittirīyāraṇyakam (1-58). ‘Śulbam’ means a rope (or thread). During ancient times a rope was being used for measuring, drawing circles, squares etc. So this discipline, which is meant for measurements of Yāgaśāla (cottage for Yāga) etc. is Śulbasūtram. The terminology employed in this work is available in Vedas to a large extent. Satyāṣāḍha – Mānava – Maitrāyaṇīya – Vārāha – Vādhūla – Kātyāyana – Baudhāyana – Āpastamba Śulbasūtras are available and they belong to different Vedas. The term ‘gṛha’ is used in the sense of a house as well as wife. The Agni (fire) caused by both of them is also called ‘gṛhyam’. So, the activities performed in a house, with wife, in Agni altar are called Gṛhyakarma. The Sūtras dealing with such activities are Gṛhyasūtram. There are different Gṛhyasūtras for different Vedas, authored by Āpastamba, Baudhāyana, Āśvalāyana, Satyāṣāḍha, Kātyāyana, Manu, Kaṭha, Jaimini etc. Saṃskāras (ceremonies for cleansing the mind) – Saṃskāra is a term that is pregnant with meaning and therefore better to adapt the term rather than try for a rendering. saṃskriyate jñānayogyatām āpādyate cittam anena iti saṃskāraḥ. anena = by performing this, cittam = mind, saṃskriyate = is refined or cleansed, jñānayogyatām = eligibility to have jñānam, āpādyate = is gotten, iti = therefore, saṃskāraḥ = it is saṃskāra. By performing the enjoined ceremonies the mind is made eligible to have jñānam (that leads to Mokṣa). Therefore they are called Saṃskāras. By Svādhyāya, different vratas, Homas, Vedavratas, Devarṣipitṛtarpaṇa, Vivāha, Mahāyajñas and Yajñas, the Ātmā, embedded in the body, would become eligible to attain Mokṣa. In other words, by the Saṃskāras, one would get ‘vividiṣā’ (a desire to know Brahman) and finally Mokṣa. atha= after enumerating forty Saṃskāras, aṣṭau = eight, ātmaguṇāḥ = virtues called Ātmaguṇas are being listed. After enumerating forty Saṃskāras eight Ātmaguṇas are being listed. dayā sarvabhūteṣu kṣāntiḥ anasūyā śaucam anāyāsaḥ maṅgalam akārpaṇyam aspṛhā iti. Sympathy, patience, not being envious, purity, desisting from difficult tasks, indulging in things that are auspicious, not begging in difficult times and not longing for others’ wealth – these are called Ātmaguṇas. yasyaite catvāriṃśatsaṃskārāḥ na ca aṣṭau ātmaguṇāḥ na sa brahmaṇaḥ sāyujyaṃ sālokyaṃ gacchati. yasya= to which person, ete catvāriṃśatsaṃskārāḥ = there are all these forty Saṃskāras, na ca aṣṭau ātmaguṇāḥ = but not the eight Ātmaguṇāḥ, saḥ = that person, na gacchati = does not get, sāyujyaṃ = either union, sālokyaṃ = or living, brahmaṇaḥ = with Brahman. The Ātmaguṇāḥ are so important that a person, although has got all the forty Saṃskāras but does not have the Ātmaguṇas can get neither living in the world of Brahman nor union with Brahman. yasya tu khalu saṃskārāṇāmekadeśaḥ api aṣṭau ātmaguṇāḥ atha sa brahmaṇaḥ sāyujyaṃ sālokyaṃ ca gacchati. tu = but, yasya khalu = to which person, as is wellknown, saṃskārāṇāmekadeśaḥ api = has got only a part of the forty Saṃskāras, aṣṭau ātmaguṇāḥ = and all the eight Ātmaguṇas, atha = certainly, saḥ = that person, gacchati = would get, sāyujyaṃsālokyaṃ= union and living, brahmaṇaḥ = with Brahma. On the other hand, the one who has got only some of the Saṃskāras but all the Ātmaguṇas would certainly get union and living with Brahman. vedo’khilo dharmamūlaṃ smṛtiśīle ca tadvidām. dharmamūlam = the roots of Dharma lies in,akhilavedaḥ = the complete Veda,tadvidām smṛtiśīle ca = the ‘Smṛti’ and conduct of those who know Veda,sādhūnām ācāraḥ ca eva = the behaviour of noble people, ātmanaḥ tuṣṭiḥ eva ca = self-satisfaction. The roots of Dharma are there in complete Veda, the Dharmaśāstras and conduct of those who know Veda, the good behaviour of noble people and finally in the case of doubt / confusion, the self-satisfaction. dhṛtiḥ = happiness, kṣamā = patience, damaḥ = control on mind, asteyam = not stealing, śaucam = purity, indriyanigrahaḥ = control of sense-organs, dhīḥ = intelligence, vidyā = knowledge, satyam = truth, akrodhaḥ = and not having anger, daśakam = this group of ten, dharmalakṣaṇam = is sign of Dharma. Happiness, patience, control on mind, not stealing, purity, control on sense-organs, intellect, knowledge, truth, not having anger – this group of ten is the sign of Dharma. rājā= the king / ruler, daṇḍayan= punishing, adaṇḍyān = those not to be punished, api ca = and, adaṇḍayan = not punishing, daṇḍyān = those to be punished, āpnoti = gets mahatayaśaḥ = great unpopularity, adhigacchatica= also goes to, narakam = hell. The ruler, by punishing those not guilty and not punishing the guilty becomes unpopular and also goes to hell. pitā = father, rakṣati = protects (the girl), kaumāre = during the age of 1-15 years, bhartā = husband, rakṣati = protects, yauvane = during youth, i.e. 16-50,putrāḥ= sons and daughters, rakṣanti = protect, sthāvire = during old age, i.e. 50+ (therefore) strī = a lady, svātantryam = the state of being alone, naarhati = does not deserve. During childhood it is father who protects the girl, during youth it is husband and during old age it is the children. Thus a lady, throughout her life, has to be protected and should not be left alone. yatra tu = in which house, nāryaḥ = the ladies, pūjyante = are being worshipped, tatra = in that house, devatāḥ = the Gods, ramante = feel enjoyment. yatra tu = but in which house, etāḥ = these ladies, na pūjyante = are not being worshipped, tatra = in that house, sarvāḥkriyāḥ = all the auspicious deeds are, aphalāḥ = a waste. Gods would feel enjoyment in a house wherein ladies are worshipped and all the auspicious deeds would be a waste in a house wherein ladies are not worshipped. Āpastambaśrautasūtra, with commentary by Dhurtaswamy and Vṛtti of Ramagnicit, Govt. Branch Press, Mysore, 1944. Baudhāyana-Śratua-Śūtra, ed. by W. Calamel, Bibliotheca Indica, Calcutta, 1904-1923. Baudhāyanaśulbasūtram, Ed. and Trans. by G. Thibaut, Dr. Ratnakumari Publication Series No. 4, New Delhi, 1968. Āpastambaśulbasūtram, Saṃskṛtagranthamālā – 73, Mysore University, Mysore, 1931. Gautamadharmasūtram, with Mitākṣarā, Chowkhamba, Varanasi, 1966. Smṛtisandarbhaḥ, Gurumandal Prakasan, Calcutta, 1952. Āpastambagṛhyasūtram, Svadharmaprakāśinī Publications, Hyderabad, 2006.